PROPERTY purchases by foreign nationals is a prickly issue even at the best of times, and a nightmare for policymakers to handle at the worst of times. And we are now in the worst of times. Locals, especially the young looking to buy their first home, complain that it is beyond their reach. On the other hand, developers have more unsold inventory than there are buyers, and selling to foreigners is one alternative because in US dollar terms, real estate in Malaysia is cheaper than in other major Asian cities. Marketing Malaysian real estate to foreigners is, therefore, not something new. Just how much is sold to non-Malaysians is hard to confirm because there are no official national statistics on this. Ask the Housing and Local Government Ministry and it will say it does not have the figures. The National Property Information Centre (Napic) under the Ministry of Finance provides data on prices and the volume of transactions by state, but it does not give a breakdown of national and non-national purchases. Without official statistics, we can rely only on what real estate agents tell us based on the transactions they handle and what we see. That said, most industry officials believe the number is at most 2% to 3% of annual transactions. According to Napic, the residential property market recorded 194,684 transactions in 2017, so 2% would be around 3,900 transactions. Statistically, 2% can be deemed a drop in the ocean, so why is there so much sensitivity about foreigners buying local real estate? Firstly, this 2% is likely to be concentrated in prime locations and can effectively drive prices up in specific areas. That is why purchases by the wealthy, in particular the Chinese in recent years, have sent home prices sky-high in places like Singapore, Vancouver and Sydney. Australia and New Zealand have tightened their rules to restrict foreigners. In Vancouver, the backlash against homes left empty by their foreign buyers was so strong that the local government imposed a 1% tax on the value of homes left unoccupied for more than six months. Singapore’s main tool to control foreign buying is the stamp duty on purchases. In July, that was raised to a hefty 20% for the first two properties. Citizens pay nothing while permanent residents pay 5% for their first unit, with the rate increasing for subsequent purchases. In Malaysia, while foreigners have to pay a higher Real Property Gains Tax when they sell, they pay the same amount of stamp duty as locals — between 1% and 3% of the purchase price — when they buy. The main restriction imposed on purchases by foreigners is price. In Kuala Lumpur, foreigners are not allowed to buy properties worth less than RM1 million while Selangor has set a base price of RM1 million to RM2 million depending on the location. In Penang, the requirement is not less than RM1 million on the mainland and not less than RM2 million on the island. Though many in the industry will disagree, if the intention is to prevent purchases by foreigners from unreasonably inflating prices, perhaps it may be better to impose a slightly higher stamp duty than to use price as a barrier. This is because developers who target foreigners will simply build homes that cost above RM1 million or RM2 million to avoid the rule. Of course the stamp duty should be much lower than the 20% that Singapore slaps on foreigners. I don’t want to sound philosophical, but the right to shelter is a basic human right. Homes are for living and should not be viewed purely as investment assets although it is widely accepted that real estate is the best hedge against inflation. Sociopolitically, it is difficult, anywhere in the world, to justify why many can’t afford one home, while others have several to their names. Worse still if the multiple home owners are foreigners. This brings us to Forest City, a US$100 billion development that was never meant to be. Or to put it another way, it was not in the economic development plan drawn up for Johor that was anchored on Iskandar Malaysia. When Country Garden, China’s biggest developer, and a local Johor entity announced in 2013 that they were going to build a city for 700,000 people on four large reclaimed islands next to Singapore, it was a shock to the proponents of Iskandar Malaysia. 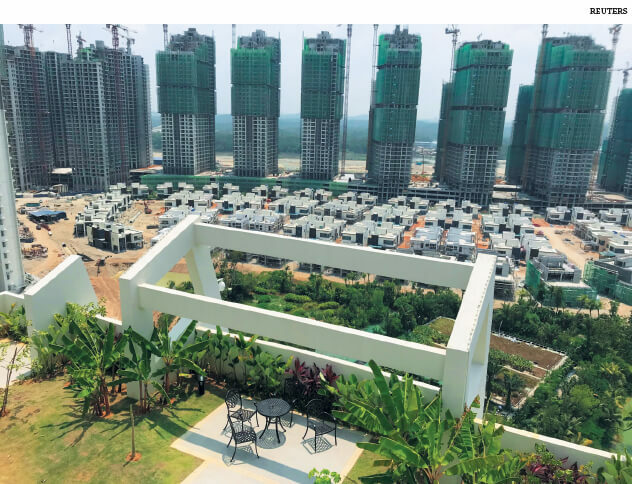 There was disquiet among developers who had sunk billions into their projects in Iskandar because they now had an unexpected competitor in Forest City, which was also given favourable concessions by the state and federal governments. No one was prepared to express their concerns publicly because Forest City had the support of the state as well as of the then leadership in Putrajaya. But there is no doubt this massive project has affected the property market in Johor by its sheer size and the uncertainties created going forward. It did not help that Country Garden had marketed the real estate it was building there to its customers in China. It was even said to have sold it as a package — pay for one unit in China and get one unit in Forest City. Forest City quickly became a lightning rod for criticism of property purchases by foreigners, in this case, by mainland Chinese. The concern of many was that Forest City would become a small city of China. Worse still, the homes would be empty most of the time as they are likely to be vacation properties. Addressing Forest City and the problem many Malaysians face in owning a home is the big housing dilemma that Prime Minister Tun Dr Mahathir Mohamad’s government faces now that Pakatan Harapan is in power. Whether one agrees or disagrees with him, the PM has made his views on Forest City very clear. What is needed now is a coherent action plan to address a complex problem. This may necessitate one or two out-of-the-box solutions rather than the usual options.